A series of monuments and memorial stones in the area that was once the Jewish ghetto in Warsaw, the largest of all the Jewish ghettos in Europe that the Nazis set up by force during their reign of terror and the Holocaust. 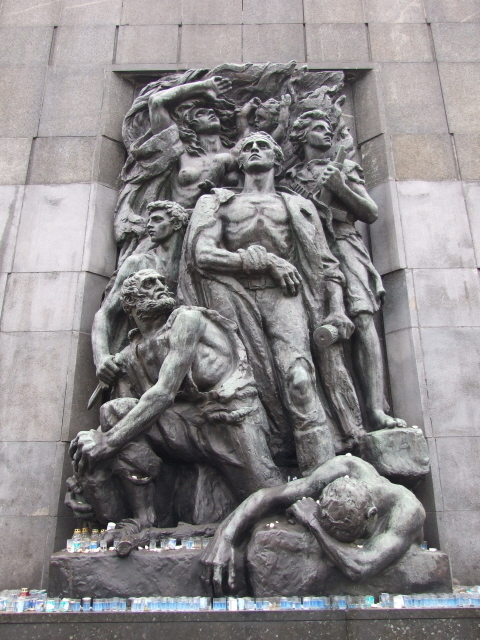 Very few people survived the Warsaw Ghetto. After the remaining ghetto population staged an unsuccessful uprising in the summer of 1943, and after some of the few survivors of that revolt participated in the general uprising of 1944 too, the Nazis completely destroyed the entire area and bulldozed it over. So today's memorial sites are largely symbolic – but still powerful reminders of the massive scale of the tragedy of the Warsaw Ghetto. The only tiny original bit that remains of the ghetto is a fragment of the actual ghetto wall, hidden in the backyard of a housing estate. More background info: Up to World War II, Warsaw had the largest Jewish population anywhere in Europe (and internationally it was second only to New York's). Then came the Nazis' occupation of Poland and with it the Holocaust. Almost as soon as the city was taken, the Nazis set up a ghetto that all Jews had to move into – a year later it was encircled with a 10 feet high wall. In addition to Warsaw's ca. 350,000 Jews, increasing numbers of Jews from outside the city were crammed into the ghetto too. The lack of sanitation and shortage of food supplies were crippling. This was, of course, quite intentional on the part of the Nazis. But not only did they let people die from the appalling living conditions in the ghetto. When the Holocaust got into full swing in 1942, co-ordinated mass murder followed too, especially with the onset of "Operation Reinhard". That was the code name for the "Final Solution", i.e. the systematic, industrialized extermination of Europe's Jewry, and thus that of Poland in particular. In Warsaw, deportations departed from the so-called Umschlagplatz to the north of the Warsaw Ghetto. Transports primarily headed for the purpose-built death camp of Treblinka. By January 1943 the ghetto population was down to ca. 55,000 to 75,000 … But a resistance movement was taking shape. Jewish resistance fighters used small arms smuggled into the ghetto for various attacks on the Nazis. This may have delayed the Nazis' plans for the ghetto. But in April the Nazis set about "liquidating" the ghetto completely. By then the underground resistance within the ghetto had become well organized. Their struggle, co-ordinated from the headquarters "bunker" of the "ZOB" movement (for "Zydowska Organizacja Bojowa" = 'Jewish Combat Organization'), lasted about four weeks and inflicted severe casualties on the SS and police. But of course the overwhelming military might of the Nazis meant that the resistance was fighting a losing battle from the start. Some 7000 Jews died in the process. In mid-May the last remaining inhabitants of the ghetto were deported, thousands were murdered straight away. But some 20,000 survivors of the Ghetto Uprising continued to hide in the city and launch ambushes on the Nazis. When the general Warsaw Uprising got underway a year later, many of the Jewish survivors took part in that fight too. After the Nazis managed to crush that uprising as well (while the Soviet Red Army, which had already reached the city's suburbs across the river, did nothing to intervene), they completely flattened the entire ghetto area (also including the infamous Pawiak prison), together with a large proportion of the Old Town and other parts of central Warsaw. When the city was finally "liberated" by the Soviets, only about 6 % of its population were still alive, amongst them an estimated 11,000 to 12,000 Jews. One of the most famous names of those survivors is that of Wladyslaw Szpilman – whose story of survival was retold to outstanding effect in Roman Polanski's rightly acclaimed film "The Pianist" (see also Krakow). 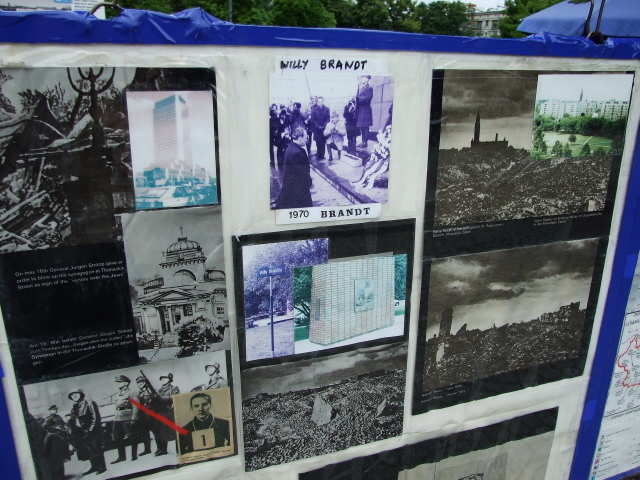 What there is to see: Since the entire Warsaw Ghetto area was razed to the ground by the Nazis after the uprising, next to nothing of the ghetto itself remains to be seen. The area was built up with drab socialist housing estates after the war – planted right on top of the ghetto's rubble, and partly incorporating it (as building material). It's thus very difficult to imagine what the area must have looked like originally. fragments of the original ghetto wall. The dramatic Ghetto Uprising Monument is by far the oldest element of the trail. It was inaugurated as early as 1948, on the fifth anniversary of the Ghetto Uprising. It sits in a wide open square. The monument consists of a 36 feet (11m) high wall-like structure made of large rectangular stones, which makes it vaguely reminiscent of the Western Wall (aka “Wailing Wall”) in Jerusalem, but is also a reference to the ghetto walls. 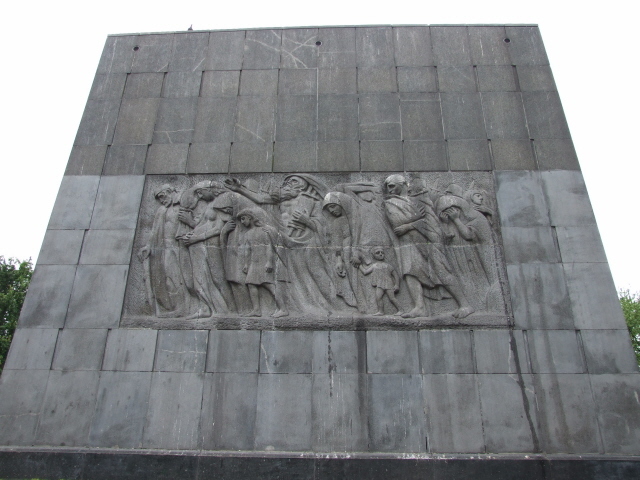 In the front of the western side facing the square is a group of bronze sculptures of resistance fighters, while on the rear, the eastern side facing the street, is a relief of a procession of dejected-looking Jews. (On a death march perhaps? You can see German steel helmets and bayonets in the background). This main monument is flanked by two menorah sculptures – and from dusk they are lit up with gas flames flickering away dramatically. Right opposite the main monument, now taking up the central part of the square, stands the new, large POLIN – the Museum of the History of Polish Jews, which has its own separate chapter here. Dotted around are a few smaller memorials and plaques.The most notable of these has to be the one found behind the museum in the north-western corner of the square – it's a brick monument with a bronze plaque that just has a name, Willy Brandt, and a date, 7/12/1970, on it. This is a reference to what was perhaps the most famous incident in the site's post-war history a moment and that was of great significance for Polish-German relations during the middle of the Cold War era: in December 1970, German Chancellor Willy Brandt (who had lived in exile, mostly in Norway, during the war and joined that country's resistance movements against the Nazis himself) was on a state visit to Warsaw. Whilst paying a visit to the Ghetto Uprising Monument he spontaneously knelt down, in silence, right in front of the monument, after he had laid down a wreath as part of a memorial service. His gesture was received as a more powerful symbol of repentance and humility than any words could have been. It can be argued that it was a contributing factor for Brandt later being awarded the Nobel Peace Prize (though it was mainly for his general achievements in the "thaw" of tensions between the Cold War opponents in the Eastern Bloc at the time, including in particular the USSR). In Germany, the gesture was received with more controversy, accusations ranging from it having been "exaggerated" to "unpatriotic". Today, it is widely agreed that the gesture was appropriate and a historic symbol of reconciliation. On the northern edge of the former ghetto are is the so-called Umschlagplatz, literally 'transshipment centre' – the implication being that people were considered lifeless 'goods'. This is the spot from where the Jews of the Warsaw Ghetto were deported to the death camps (in particular Treblinka). 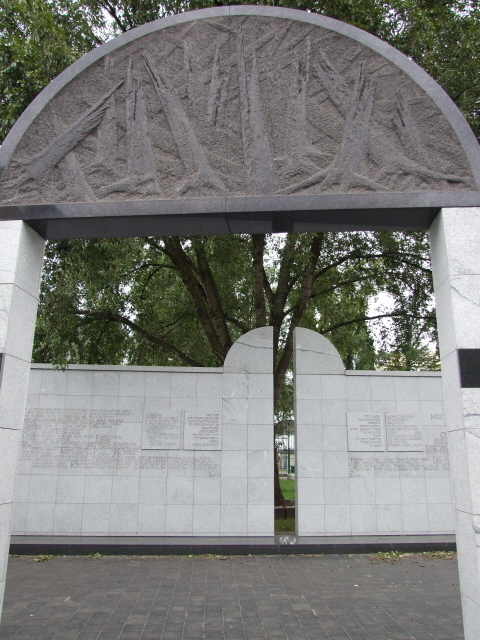 Like the rest of the ghetto, nothing of any original structures remains, but a relatively new (late 1980s) monument commemorates the function of the place. The monument itself is supposed to resemble a cattle wagon, like the ones used to transport the victims to the camps – but you wouldn't think of that if you didn't know it was meant to look like such a carriage. It sits rather forlornly by a busy road surrounded by post-war apartment blocks. Inside the white marble walls are a few plaques (in Hebrew and English) pointing out the significance of the place. In addition sections of the inside wall are covered with 400 Jewish first names – to represent the ca. 300,000 people sent from here to their deaths in the gas chambers. 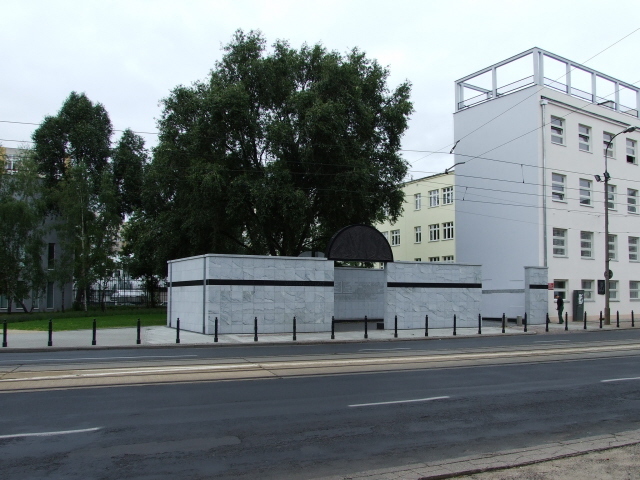 The 'ZOB bunker' is really just a mound of earth, made from the rubble of the destroyed buildings on Mila Street, once a focal point of Jewish life in pre-war Warsaw, now a dull residential area consisting of drab and uniform post-war apartment blocks. The ZOB (the acronym stands for "Zydowska Organizacja Bojowa" = 'Jewish Combat Organization') had its largest bunker at this site, which served as a command point in the Ghetto Uprising. In the end, when overpowered by the Nazi forces, many of the remaining resistance fighters took their own lives rather than letting themselves fall into the hands of the Nazis. Thus this site is also their grave. This is commemorated by a memorial stone at the top of the mound (in Polish and Hebrew) and a newer additional stone at the foot of the mound (in this case with text in English too). To be found further afield, and not strictly speaking part of the Ghetto Trail as such, are some fragments of the original ghetto wall. These are located between ul. Sienna and ul. Zlota off al. Jana Pawla II towards the bottom of this boulevard by the main train station (Warzawa Centralna). They are a bit tricky to find, as they are wedged in between apartment blocks' courtyards and not visible from the road. When you find them you'll see a plain brick wall, some 10 feet (3m) high, which wouldn't look like anything at all remarkable if it wasn't for the memorial plaques set into the wall, the pebbles and candles placed by them, and the wreaths at the bottom of the wall. A plan shows the outlines of the ghetto that this piece of wall marked the border of. 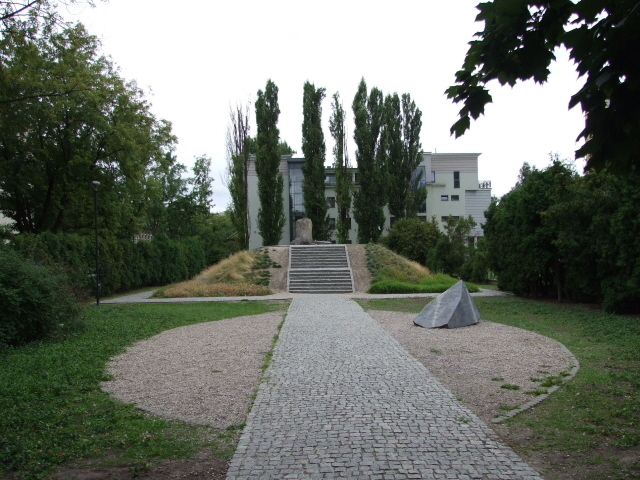 Locations: The main stretch of the Ghetto Trail (and the 'path of remembrance') are located in the north-west of the city centre, about a mile (1.5 km) west of Warsaw's Old Town, between ul. Stawki (Umschlagplatz), ul. Mila (ZOB bunker) and Plac Bohaterow Getta off ul. Anielwicza. The ghetto wall fragments are located in the south-west of the city centre, between ul. Sienna and ul. Zlota off Jana Pawla II boulevard, just a bit up from the main train station, opposite the Holiday Inn hotel and the Warsaw Tower. Access and costs: mostly fairly easy to reach; and free. Details: you could start at the northernmost point at Umschlagplatz on ul. Stawki, reached by a short walk from the tram stops by the Rondo Babka roundabout, where the wide boulevards of Jana Pawla II and Okopowa meet. From Umschlagplatz walk down ul. Karmelicka and take a left turn into ul. Mila. At the next street corner you'll find the 'ZOB bunker' memorials. Turning right and walking one block down ul. 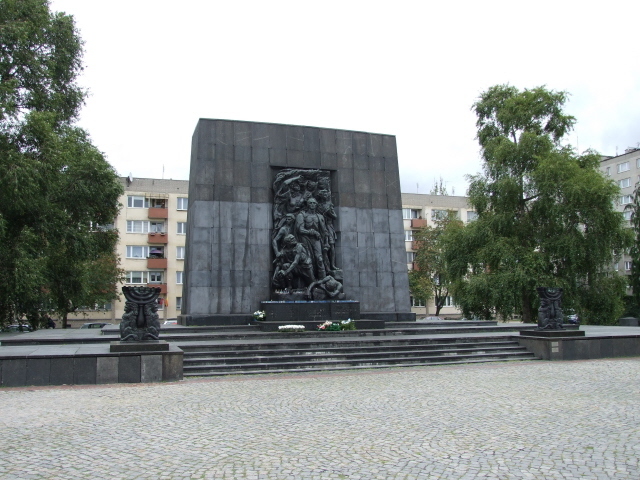 Zamenhofa takes you to Plac Bohaterow Getta with the big Ghetto Uprising monument and the new POLIN Museum. Or do it in the opposite direction, starting at the Ghetto Uprising monument. All of the open-air sites are freely accessible at all times. The ghetto wall fragments are a bit more tricky to track down, as they are sandwiched in between housing estates, namely in the courtyards to the rear of the apartment blocks along ul. Zlota and u. Sienna. They are best entered from No. 62 ul. Zlota. The gate should be open during daylight hours. But if you find it locked you can try what the Rough Guide suggests: ringing the bell at apartment No. 24 or 38 to get someone to open the gate for you. Time required: None of the points along the Ghetto Trail take long to look at, maybe a few minutes each … but allow a bit of extra time for contemplation. The whole trail can be done in a couple of hours – if including the ghetto wall fragments factor in extra walking time to get there (or take a tram down Jana Pawla II). When the new museum opens its core exhibition, this will likely require a significant additional amount of time as well. 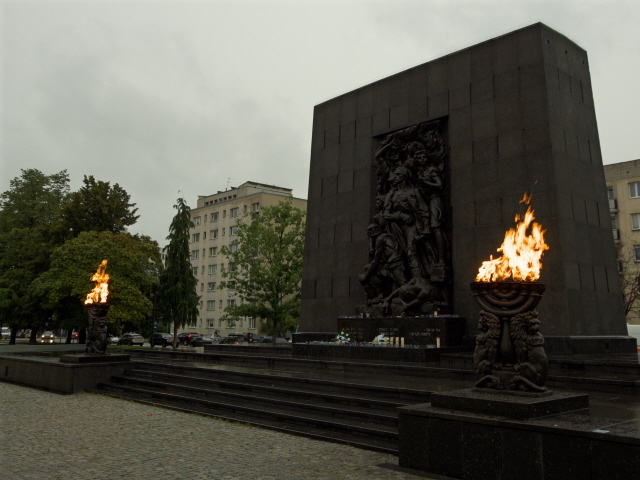 Combinations with other dark destinations: in general see Warsaw – of course, the Ghetto Trail is already a combination of sights, but this can be augmented by taking in, for instance, the Pawiak prison museum, which is located just 200 yards from Plac Bohaterow Getta – just walk down ul. Zamenhofa a bit further south and then turn right into ul. Dzielna towards Jana Pawla II. When starting the walk of the Ghetto Trail from Rondo Babka, consider going up Okopowa for about two thirds of a mile (or a couple of tram stops) where you can find the large Jewish cemetery, or Cmentarz Zydowski. The ghetto wall fragments are quite near the Palac Kultury i Nauki, worth a visit in itself, and just north of that you can find another site of importance for Warsaw's Jewish heritage: the Nozyk Synagogue off Plac Grzybowski to the west. It's the only synagogue that survived the destruction of the ghetto area in World War II. Next door, the Our Roots agency has its main office – they can organize guided tours of Jewish sites. Just to the west of Plac Grzybowski you can see some of the very few old(er) buildings that survived the war – they are in a bad state, however, with partly bricked-up or boarded-up windows; but photos hanging off the walls and windows recall the old days of city life in these parts in pre-war Warsaw. It's quite an atmospheric sight to behold. The Jewish Historical Institute would also make a good addition to tag on to a visit to the Ghetto Trail sites: it's located at No. 3/5 ul. Tlomackie, right by the Ratusz-Arsenal metro station. It hosts various exhibitions and also offers a number of guided tours, of the former ghetto, the Jewish cemetery, the Jewish Praga district or ones following “in the footsteps” of notable persons (including Janusz Korczak – see also Korczak orphanage). You can also attend the screenings of the film “912 Days of the Warsaw Ghetto”. Otherwise the Institute is a treasure trove of Jewish art and is also the home of various historical, scientific projects and offers assistance on genealogy. Opening times: weekdays 8 a.m. to 6 p.m., Sundays from 10 a.m. (exhibitions and screenings always from 10 a.m., last screening at 5:15 p.m.). Admission to the exhibition part and film screenings: 10 PLN, otherwise free. Guided tours have to be specially arranged (and fees apply). Combinations with non-dark destinations: in general see under Warsaw. The principal mainstream tourist draw that Warsaw offers is the reconstructed Old Town, which isn't far from the northern parts of the Ghetto Trail, less than a mile (1.5 km) east of Umschlagplatz and the Ghetto Uprising monument.